This post is really a continuation of my thoughts from yesterday about giving and receiving. I have been learning Hebrew for the last few years. It really is a fascinating language filled with deep meaning. I think it’s impossible to learn the language without also learning deep insights into spiritual truths and how to live life. In studying Hebrew, I have learned that much of Western culture is built upon Greek thinking. The Greeks were logical thinkers, They discussed abstract ideas. They believed in cause and result, and that if A was true then B could not be true. This is contrasted with Hebrew thinking, which was very concrete and action oriented. The Hebrews didn’t discuss beliefs they lived their beliefs. They were comfortable with mystery, and they believed that two opposite things could both be truth. “These also are the words of God,” they say. While a Greek-thinking person would argue whether we chose God or God chose us, a Hebrew-thinking person would say that both were true: God chose us and we choose Him. The Bible is filled with these opposite truths, these paradoxes: God is sovereign yet man has freewill, Yeshua (Jesus) was God and also man, the Bible was written by men but was God-breathed, and so on. I believe that we have to hold on to both opposite truths. If we go too far to one extreme or another we fall into error. A lot of church denominations have split because some believed one truth and not its opposite. What does this have to do with giving and receiving? As I wrote yesterday, I believe that if we must stay balanced between giving and receiving. If we give and refuse to receive, we fall into one kind of error, and if we receive but refuse to give we fall into another kind of error. It’s very humbling to have to be the receiver. To receive, a person must admit that he has a need, that he can’t handle life on his own. We can’t receive God’s forgiveness if we can’t acknowledge that we need forgiveness. We can’t receive His mercy unless we acknowledge that we need mercy. We can’t receive His comfort if we can’t acknowledge that we need comforting. In order to obtain what God has to give us, we have to be willing to receive. As I wrote yesterday, I’ve observed that people who give but refuse to receive often have a facade of strength, but they can become too proud to admit their weakness and need. If they can’t accept the help of other people, they cut off a lot of God’s care because often God supplies our needs, gives us comfort, and lifts us up through people. I often think of a short story in which a man was stranded on the roof of his house as a result of major flooding in his area. He asked God to rescue him. A short time later a helicopter hovered overhead and a person called out to ask him if he needed help. “No,” the man replied. “God will rescue me.” The helicopter flew away. A bit later, a speedboat came by, and those in the boat asked if they could rescue him. “No, God will rescue me.” Off sped the speedboat. Then a man in a rowboat came by. “Do you need help?” “No. God will rescue me.” Away went the rowboat. At this, God called from heaven, “I’ve sent you a helicopter, a speedboat, and a rowboat…what more do you want?? ?” If we can’t accept the help God sends through others, we are actually rejecting His gifts. Yet, those who always receive and never give are often very self-centered, moaning about their troubles with very little compassion for others who are hurting. There are times when we are all weak and needy and we cannot go on without someone to lift us up and help us get back on our feet. 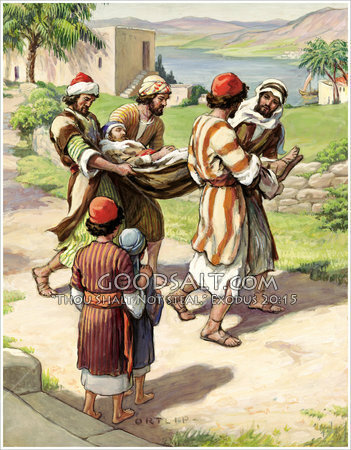 (In the Biblical story, the sick man could not have made it to Yeshua without the help of his friends who carried him.) However, at some point we need to reach out to others who are also suffering. Even as my family suffers with JJ’s cancer, there are people around us who are struggling with severe illness or other problems. They are reaching out with comfort to me (which I receive) but I also try to reach out with comfort to them (giving to them). We must both give and receive. Sometimes we are able to give more, and sometimes we must receive more, but in the end it’s a balance between the two. 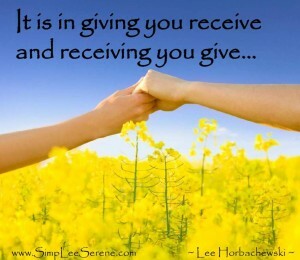 I think giving and receiving go hand in hand: How can you give if no one receives? Yet, how can you receive if no one gives?The curious thing is that when one person gives and the other person gratefully receives, the recipient gives a blessing to the giver by their receiving of his gift.